Stanford scholar encourages people to balance busyness with contemplation. In a recent book, Stanford scholar Blakey Vermeule says it’s important to take time to contemplate and self-reflect in order to have a fulfilling life in today’s busy world. Rats in a race. Hamsters on the wheel. These are some common phrases people today use to describe their constantly busy lives. People who feel tied down to a nonstop treadmill of work and responsibilities would benefit from taking some time out for self-reflection, said Blakey Vermeule, a professor of English at Stanford. 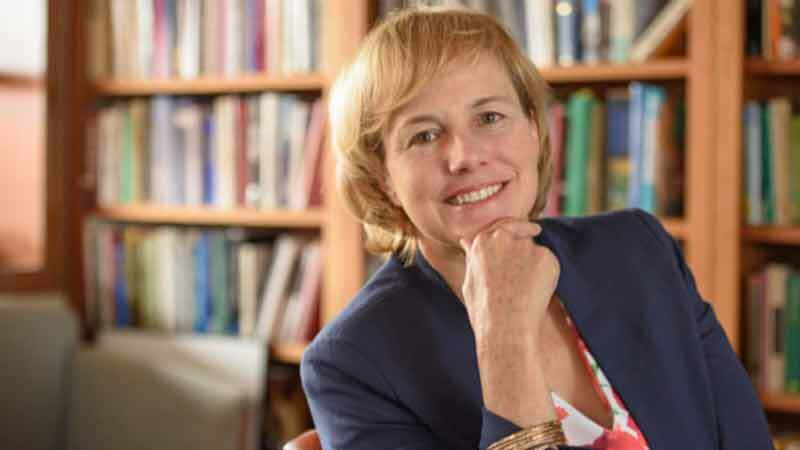 Vermeule discusses the benefits of thoughtfulness in a recent book she co-authored with Jennifer Summit, a former Stanford English professor: Action versus Contemplation: Why an Ancient Debate Still Matters. In the book, Vermeule examines how some of today’s problems – like the work-life debate and workplace stress – are connected to the pressure between being in what she calls a contemplative and an active state. She traces this tension all the way back to Aristotle, who argued in his writings about whether a person’s life is better spent in contemplative study or physical work. These ancient arguments are still relevant today, Vermeule said. “I want people to continue wrestling with these tough, old questions: What is the relationship between cultivating your inner life and having enough capacity to act in the world? Are action and contemplation necessarily at odds, or can we hope to achieve a balance between them?” asked Vermeule, who believes that too many people today are obsessed with data-driven results and demonstrating how they make a concrete difference in the world. There are other ways to make an impact, she said, like slowing down to show kindness and awareness for one’s surroundings. These are things that can’t be tracked by numbers and statistics. The Stanford News Service interviewed Vermeule about her latest work. What do you think Aristotle would say about our society’s fast-paced way of life? Aristotle believed that contemplation was the highest human good, leading to direct knowledge of the divine. To him, contemplation meant intensive self-reflection over one’s lifetime. Aristotle’s writing practically shimmers with pleasure when he talks about contemplation, as if he has found an amazing treasure that he wants to urgently share. Like Aristotle, Buddhism, Christianity and even psychoanalysis also see self-reflection and the task of becoming the best person one can be as the work of a lifetime. Our current American values would probably seem pretty foreign to Aristotle. They center on wealth, convenience and a “perfect heaven” of consumer choice. At best, ordering yourself through reason and intellect is viewed as an autodidact’s pursuit. At worst, it is a pastime for eccentrics. Our culture does not encourage a contemplative life. In the book, you and Jennifer Summit cite researchers who say that the epidemic of stress in our culture results from the absence of a purpose or meaning in life, rather than physical exhaustion. Why do you think so many people today are especially struggling with finding their purpose? That’s a hard question, one that many different kinds of thinkers are writing about. My sense of it – drawing on the contemplative tradition we lay out in the book and especially on the writings of George Eliot – is that meaning and a sense of purpose come from tending to a thick, local web of connections with our families and communities, a web that is often nurtured slowly over decades. It comes from patiently caring for and tending to a smallish plot, whether that plot centers on a family, a business, a craft or a loyal group of colleagues and friends. Maybe the simplest thing to say is that our culture puts enormous stress on those deep local connections. It radically and often contemptuously devalues them. Our culture’s master values are freedom, autonomy, and choice, but as a result of that we end up undervaluing the importance of local, often very minute, connections and traditions. Can you share an example from your life where you had to balance action and contemplation? How did you approach that dilemma? Our culture has a profound, almost worshipful bias that favors action. This bias is the stuff of much satire, but I find it quite devitalizing. I’m a long-time contemplative. My daily practice includes ample amounts of meditation and introspection. I try to bring a wider awareness to every situation and interaction. Conflicts arise all the time in the course of human relationships. I find that the larger my awareness can be, the less engaged I am in the urgent drama of the moment; the less I feel I have to solve things or fix things. What would you advise college and high school students today who are craving for a meaningful way of life that combines action and contemplation? Get a strong and solid humanities education. Test your intuitions against those of some serious thinkers and artists. Psychoanalyst Sigmund Freud said that the two most important things to get right are love and work. They are also the hardest. Over the years, I’ve watched almost everyone I know struggle with one or the other or both. I don’t know anybody who has managed to fully settle both parts of life, though many people thrive in one or the other sphere. In my own life, intensive reading has allowed me to become intimately familiar with my own inner world, the good, the bad and, most especially, the ugly. Knowing yourself, in all the messy and the weird and antisocial, is probably the best way to smooth out the inevitable bumps and wrong turns that all of us take. Marcel Proust can genuinely help with that – Alexander Pushkin, too.